St. Mary’s Dominican High School students (from left), Molly Gaffney, Kate Heller, Alexis Favalora, and Elise Bourg receive band and choir honors. 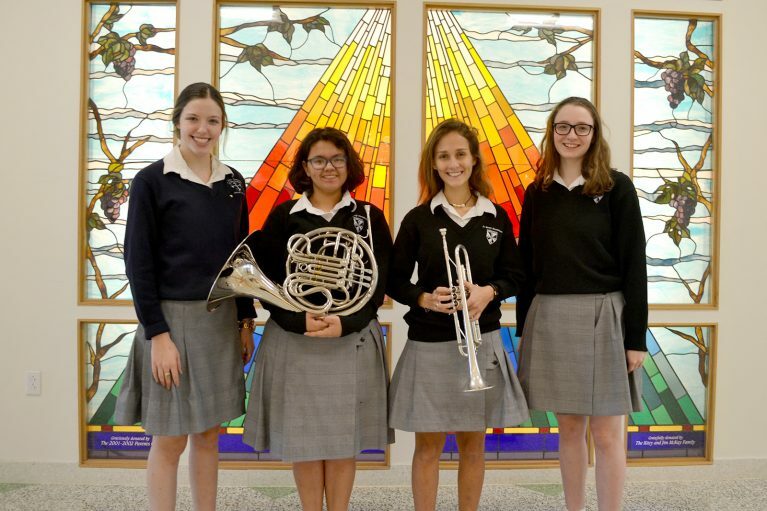 St. Mary’s Dominican High School students Elise Bourg, Alexis Favalora, Molly Gaffney, and Kate Heller have received honors in band and choir. Molly Gaffney is a finalist for the New Orleans Opera Vocal Competition that was held at Loyola University. She was accepted into the Louisiana Music Educators Association (LMEA) All-State Senior High Honor Women’s Chorale. Gaffney and Elise Bourg were accepted into the Louisiana American Choral Directors Association Senior High Honor Women’s Chorale. Their clinician is Z. Randall Stroope, an international composer, clinician and conductor. Bourg also was accepted into the LMEA All-State Senior High Honor Mixed Choir. Alexis Favalora was accepted into the LMEA All-State Senior High Honor Symphonic Band. She placed 9th in state on trumpet. Kate Heller was accepted into the LMEA All-State Senior High Honor Concert Band. She placed 9th in state on French horn. Favalora and Heller were accepted into the Colonel John R. Bourgeois Senior High Honor Band at Loyola University. The band features Col. Bourgeois, a retired conductor, composer and arranger of “The United States President’s Own” Marine Band. He was the 25th Director of the United States Marine Band and his acclaimed career spanned nine presidential administrations, from Presidents Dwight D. Eisenhower to Bill Clinton.